There is a small culinary crisis in my kitchen…I am out of quinoa. This has been such a go-to side dish for me in the last two weeks. It’s fast. It’s slower than couscous which I actually like. It’s healthy. It’s fun to eat. And I’m out. Rawr. However, it did go out with a bang. I pretty much made this recipe up – and if my memory is correct, it was the first dish I made with quinoa. It’s a tough call, but I might even prefer it to the broccoli-cheese variation of earlier. I’ve learned in the last few years what a delicious combination mango and avocado are so I’m always looking for new additions to that lovely little combo. This one has some sweetness, earthiness, texture, and while I didn’t add any – I believe heat would come alongside quite nicely. Technically it’s probably a side dish and as such could serve 2 – 4. However…as a single gal, I don’t have to share my delicious food unless I want to and I scarfed it all up on my own. Both times. I won’t rat you out if you choose to do the same. 1. Cook quinoa according to package directions. This gives you 15-20 minutes to assemble the rest of the salad. Mince/garlic press the clove(s) of garlic into the boiling water so it infuses into the quinoa. 2. 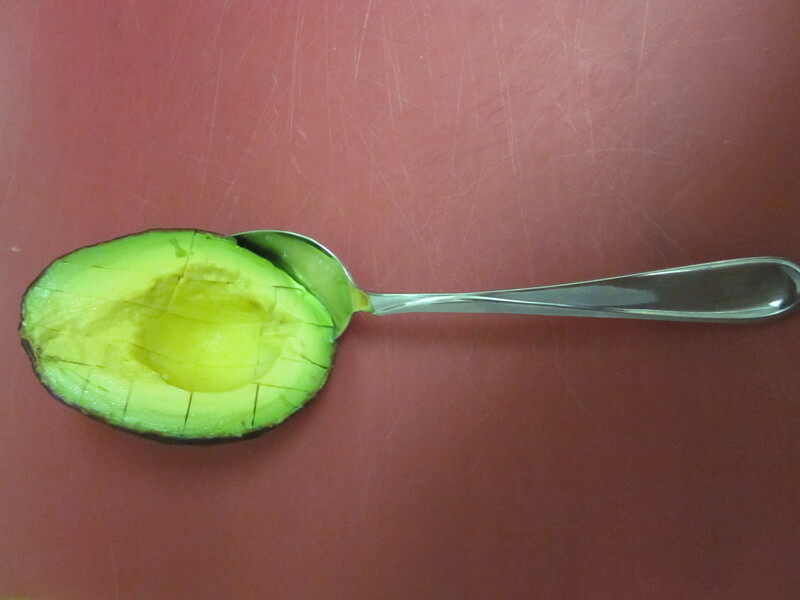 Cube the avocado and dump into bowl. My suggestion for cubing: Slice the avocado flesh into cubes, but do not cut through the skin. Scoop the cubes out with a spoon in a circular motion. Out they’ll come. 3. Cube the mango and cut into the bowl. 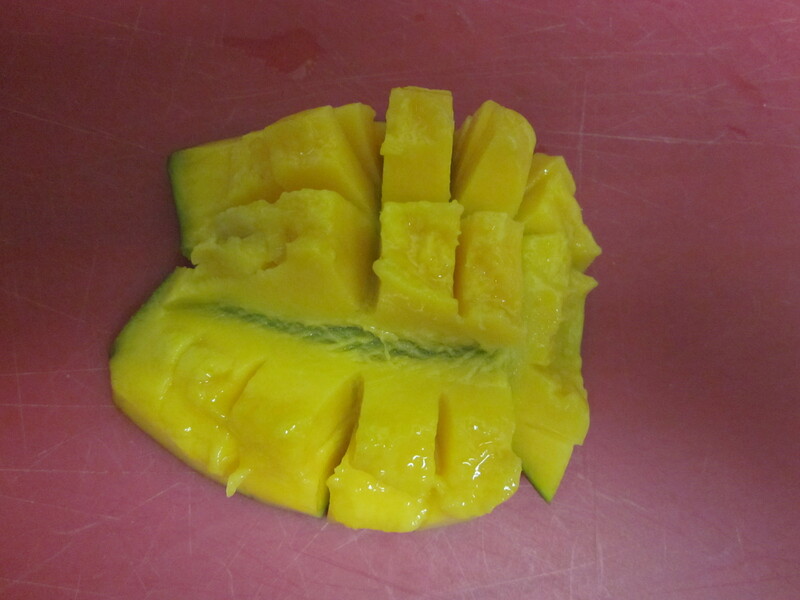 My suggestion for cubing: Cut a portion of the mango away from that crazy large pit. Carefully score the flesh into cubes, but again – don’t cut through the skin. Pop it out (see picture) and carefully cut the cubes away from the skin. 5. 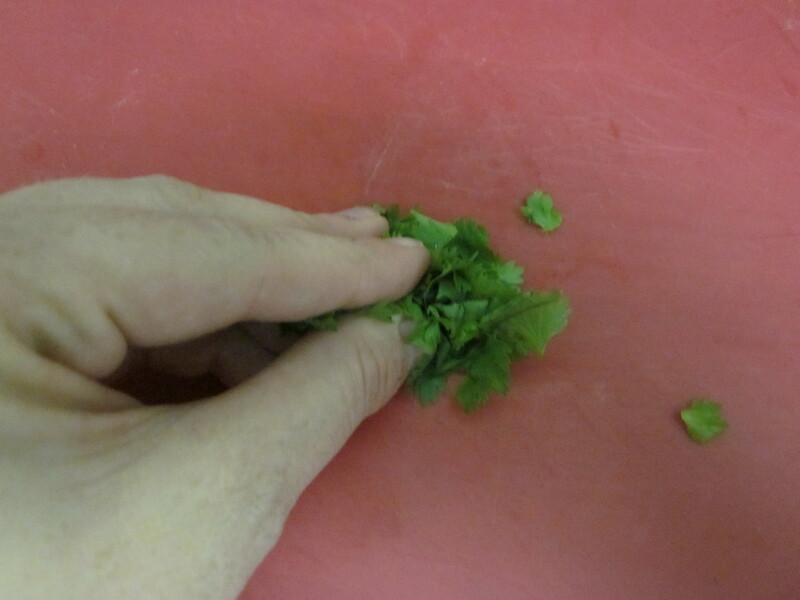 Pick as many cilantro leaves as you wish, scrunch up into a tight bunch and slice thinly. Toss into the bowl. 6. Add 1 capful of lime juice and gently stir around. 7. 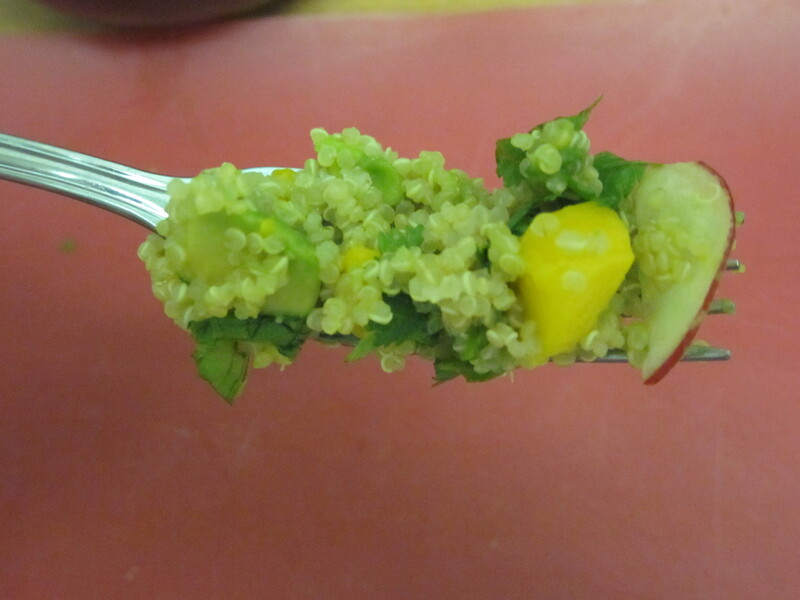 When the quinoa has boiled, cooked, and cooled a bit, add it to the bowl and gently fold in. 8. Eat and be happy. Don’t let the mango intimidate you. They can be slimy, slippery suckers. The score, pop, cut method seems to keep the slippage to a minimum. I have also peeled it with a potato peeler and just cut the flesh away from the pit, dicing into irregular pieces as I went. While there are many things I think one could add to this salad that would be delicious – be careful of adding so many flavors that they become indistinguishable. Texture is a big thing for me in eating so I would most strongly recommend something with some crunch and a bit of tang. I hope you find this to be as delicious as I did. Happy eating! Interesting. I would never have thought of putting that combo with quinoa. I don’t know exactly what made me think of it, but I promise I wouldn’t post the recipe if it had turned out to be gross! 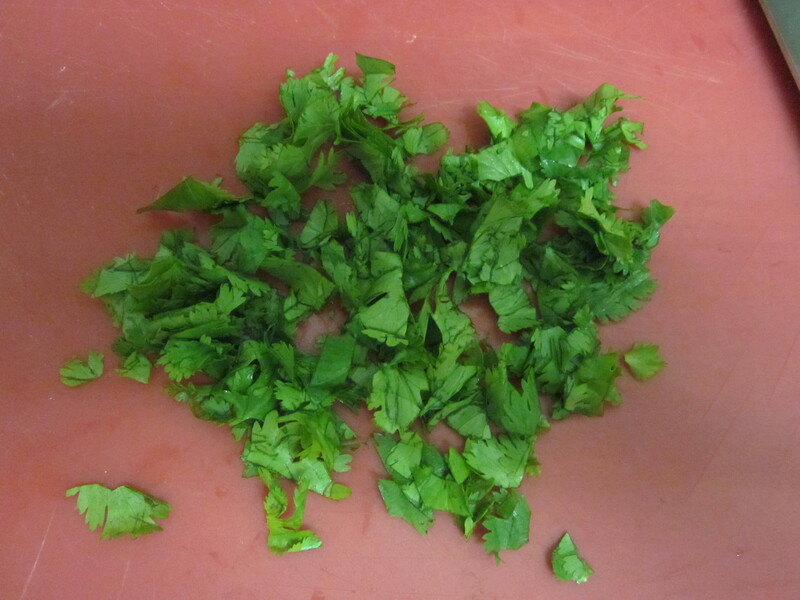 Cilantro to taste = None. Tonight Justin made a black bean soup and while it called for cilantro, he was kind enough to leave it out as a garnishing item instead. That was a good call. That looks really, really, really good, Karen! 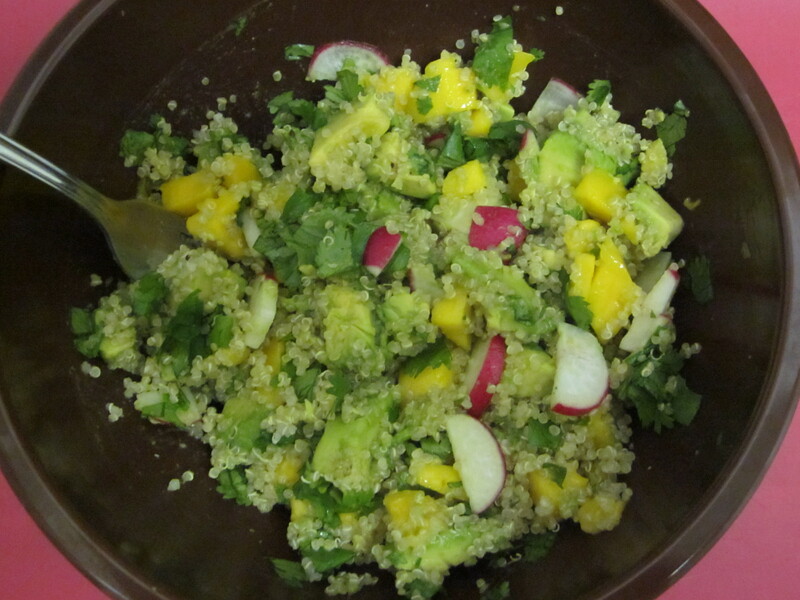 Cilantro, mangoes, avocados, and quinoa are all top favorite foods of mine… especially mangoes and avocados. I will have to try that the next time quinoa is in the house. I love mango and avocado together! 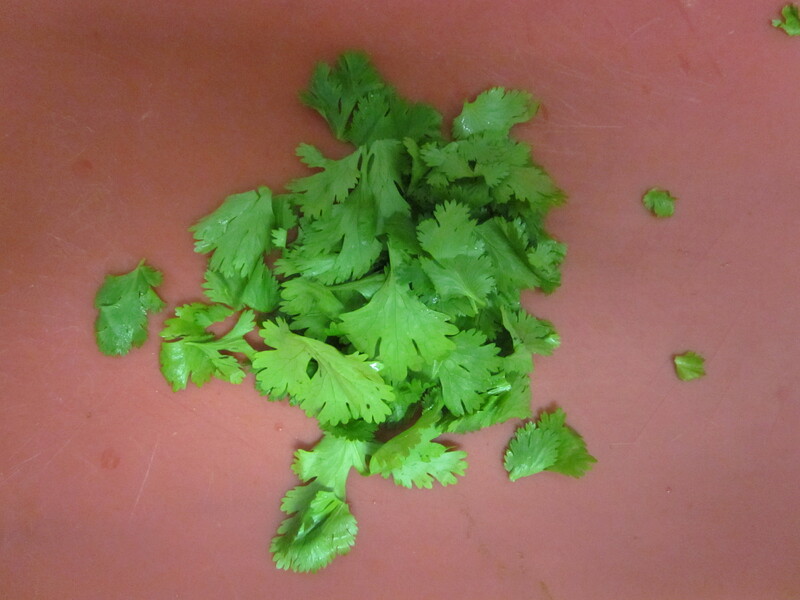 I, however, am firmly in the NO cilantro camp… Quite possibly the world’s most evil herb. I recently read that Julia Child agreed with me about my hatred of cilantro, reporting that she felt the need to “throw it on the ground and step on it!” I quite agree. HAHAHAHA! That’s hilarious! I heard someone say it tastes like soap to them. I suppose if it tasted like soap to me, I would not want to eat it either.